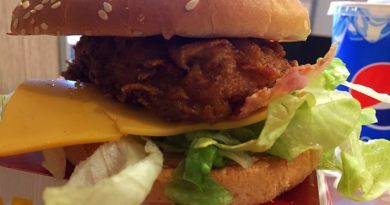 KFC Big Daddy Burger - Price, Review, Calories & More! 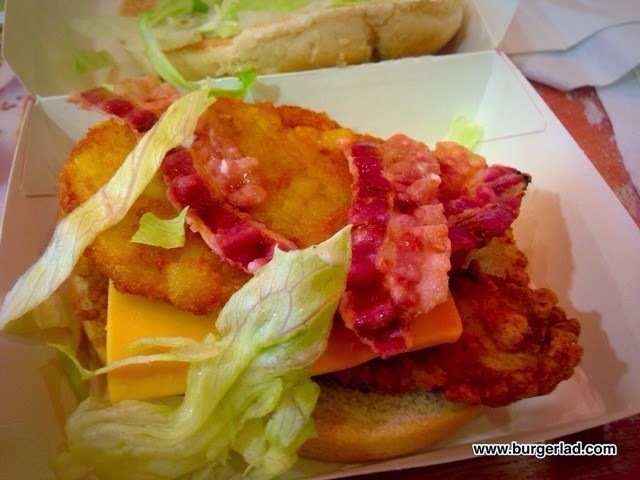 Bring a big appetite because with a whole chicken breast fillet, hash brown, bacon and slice of cheese barely contained between the toasted sesame bun, you’re going to have to be hungry. Oh, and there’s Heinz Ketchup and our signature mayonnaise in there too. Price: £3.99 for the burger only. Today in the UK is National Burger Day and bizarrely Burger Lad® is not participating. Well every day is Burger Day in our world. Anyway… today also saw the launch of a KFC UK & Ireland Twitter account – we’re honoured to be one of their first followers! So to celebrate this momentous occasion we checked out the Big Daddy Burger. This was either a new branch or one benefitting from a recent refurbishment. 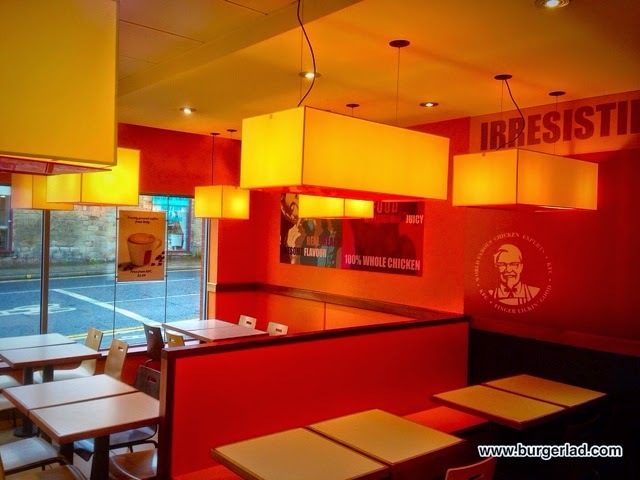 I have seen some KFC branches that look like they haven’t been refitted since Milli Vanilli were in the charts. The garish colours aren’t my favourite, but it looks and feels new, and the lighting is nice. These aren’t necessarily the main things one thinks about, or even writes about when visiting a fast food outlet, but I admit I’m procrastinating a bit, because today’s burger was just so bland. 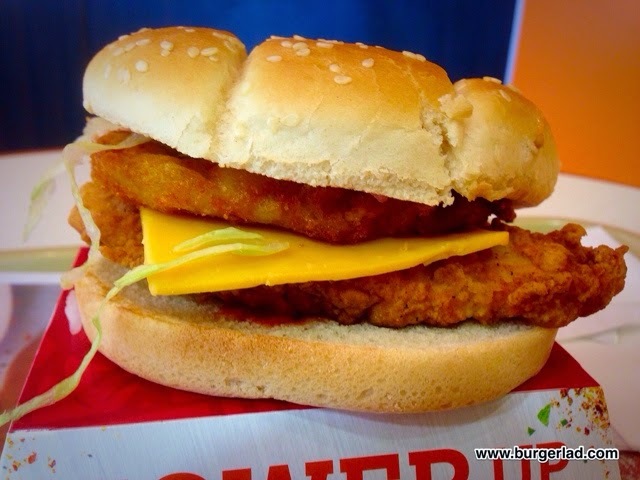 The Big Daddy from KFC is essentially a variation on the Fillet Tower burger, with the chicken fillet, cheese, hash Brown, lettuce etc. 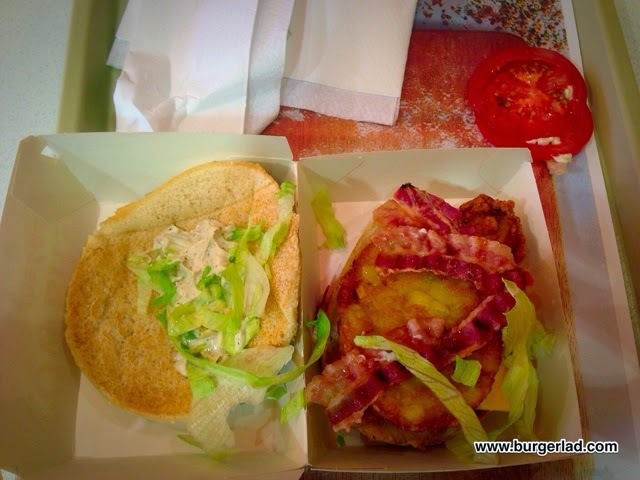 The differences are that it includes bacon, fresh tomato and peppery mayo. 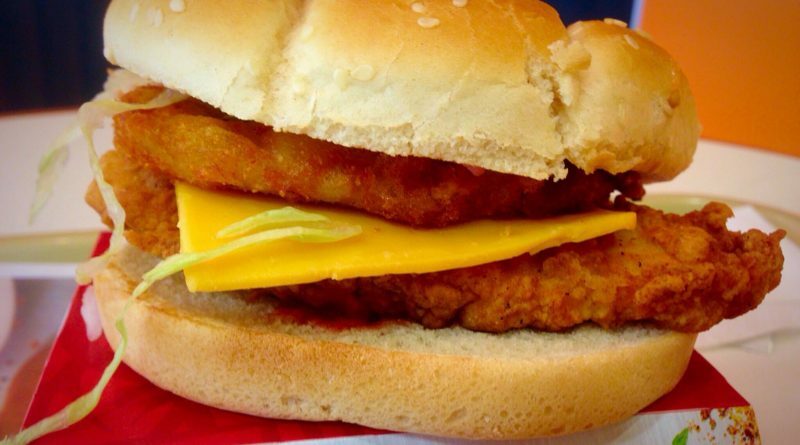 It was made up from scratch by a very polite and friendly member of KFC staff. So, sitting down and opening my burger up to get the inside photos, I first removed the slices of tomato. They looked big and they looked fresh, and those of you who like tomato on your burger would like those. I don’t. Next, the bacon. Three fairly conservative pieces draped across the burger. They looked a bit limp and as I ate through the whole burger, I just didn’t get the bacon taste at all. The chicken fillet was as per usual at KFC. A good chunk of breast coated in their crispy goodness – and covered in cheese. The peppery mayo was probably the most interesting thing in there. It did give a faint hint of bite, something to raise a smile, but it was very much on its own in cutting through the blandness. The Big Daddy isn’t a bad burger. It isn’t a great burger. It’s just OK. And that brings me to the main problem with it. The Zinger. The Zinger or the Zinger Tower are such good basic high street burgers, that the Big Daddy and the Fillet burgers aren’t interesting enough by comparison. 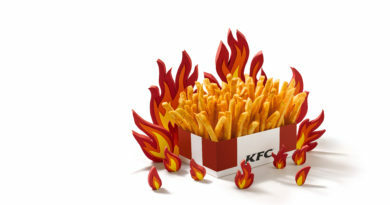 That little injection of spice in the Zinger sets it far above others, and although the peppery mayo in the Big Daddy was trying ever so hard, it just couldn’t match its cousin’s jazz. 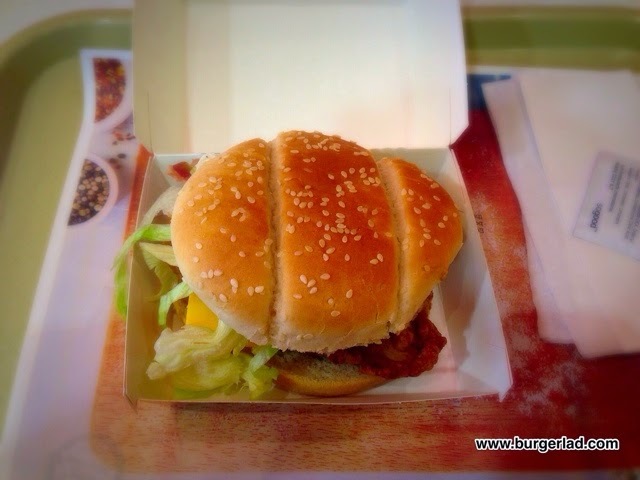 Are you more of a Zinger person…? So there you go. 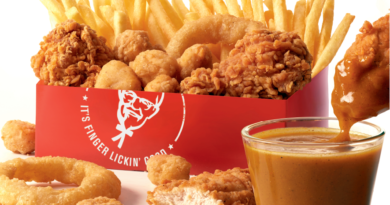 The Big Daddy from KFC. It isn’t a Zinger. And don’t forget… two Big Daddy Burgers can nearly re-create that infamous Double Down! !